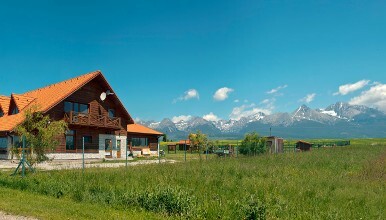 Located in Šuňava, a village situated at the foot of High Tatras, in the picturesque landscape created by High and Low Tatras and surrounded by meadows, the Penzion U orla offers wonderful view of Tatra´s peaks for its guests. Just imagine… panorama of the smallest of the alpine mountains in the world, homelike atmosphere breathing with family comfort, specialties of home cuisine and friendly care about our guests. Our Penzion will surely daze you by its unique ambient and its surrounding which is ideal for relax and recover new strengths. A small ZOO which is part of the Penzion´s area guarantees extraordinary experience during your holidays. In Penzion U orla you meet not only horses and sheeps, but also llamas. It is the only locality in High Tatras where these exotic animals are bred, and therefore it offers - besides traditional holiday - something more, something you cannot find anywhere else in the region. Think about it… have you ever seen llamas in Tatras before? Above standard accomodation for total capacity of 20 persons in two apartments and four 2-bed rooms for maximum comfort of guests will enhance your experience during holidays. In our restaurant we offer rich breakfast, lunches and dinners from home cuisine. Total capacity of the restaurant is 40 persons indoor and 60 persons in an outdoor terrace. Enjoy your time in sauna or in our fitness. Take your time and enjoy watching TV in our dayroom or play a billiard game with your friends. In our Penzion, we have recently started to breed various animals and so our farm is a huge attraction for our little guests. here is a playground full of adventure and challenges waiting for our smallest guests, where they can safely play. Your little ones can have fun on monkey bars, slides, trampoline or play various ball games. Enjoy hiking on fresh air in High Tatras! Enjoy your holiday full of relax using services of outdoor swimming-pools and thermal parks. If you buy 2 nights stay with breakfast, you will get a bonus – third night with breakfast FOR FREE! If 2 persons buy the “family stay” package, two children up to 15 years will have the stay for free. Enjoy a romantic stay in Penzion U orla. Invite your beloved person to spend unforgettable romantic moments in a beautiful pension. Are you more than 65 years old and would you like to go to an interesting holidays? Enjoy walks in spectacular natur of Tatras! Penzion U orla is an ideal place for organization of seminars, workshops, schoolings, presentations or company banquets and parties.